Celebrating Over 20 Years in the Treasure Valley! Forever Green – Frequently Asked Questions Here are some frequently asked questions about our lawn care products and services. Billbugs What do Billbugs look like? What do Billbugs do to my lawn? 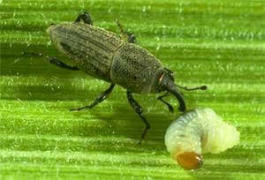 Billbug larvae eat the root system of many species of lawn. 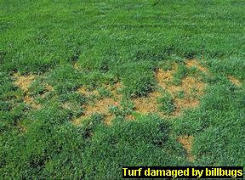 This root eating action along with ninety to one hundred degree-days will severely damage a lawn. How do I control Billbugs? Those people with Billbug susceptible lawns have two choices for control. The first is to put a preventative application down before the Billbug activity is high. If you have missed this window and already have Billbugs in the lawn, a post emergent Billbug application will be necessary, followed by overseeing in the fall to replenish the damaged areas. Fertilization How often do I need to fertilize my lawn? Lawns get the best results when fertilized every five to seven weeks in the cooler seasons and six to eight weeks in the hotter seasons. Why should I winterize my lawn? The benefits of a good winterizer are not immediately apparent. However, it is considered to be the most important application of the year. Even though the lawn stops growing over the winter, the root system does the majority of its development during that time. The key to a thick healthy turf is a strong root system, and that starts with a good winterizer. Kids and Pets When can my kids & pets go back on the lawn? There are no restrictions for kids and pets after a fertilizer application. Weed control is liquid, and should be dry before entering the lawn (30 min. or less on hot days). Remember that Forever Green "spot treats" weeds, meaning that we treat only the visible weeds, not necessarily the entire lawn. Customers who have been with Forever Green for multiple seasons have very few weeds, thus they get very little weed control. Mowing How tall should I cut my grass? The first and last mowings of the season should be the shortest (2"-2.5"). Shorter lawns during the winter will have less chances for snow mold and harsh winter kill. The height should be increased (3"-3.5") as the temperatures increase. A longer grass blade will hold moisture and prevent weeds. These heights also pertain to line trimming the edges; short edges lead to crabgrass. How often should I mow? The lawn should be mowed at least once a week with blades sharpened several times per season. If you prefer mulching, every five days to twice a week works the best. Forever Green wants to be your choice for lawn care services in the Treasure Valley. If you did not find the answer to your question on this page, please contact us or call us directly at 208-364-4000 for more information.